Kotlin as a programming language provides some very powerful features, which allow the creation of custom internal Domain Specific Languages (DSL). One of these features, I also wrote about on this blog, is called Function Literals with Receiver, others are the invoke convention or infix notation. In this article, I will show how to create a Kotlin DSL by introducing a library that exposes a DSL as its API. I’ve often been struggling with Java’s API when I had to set up SSL/TLS connections in scenarios where I e.g. needed to implement HTTPS communication. I always felt like wanting to write a little library that can support me with this task, hiding away all the difficulties and of course the boilerplate needed for it. The term Domain Specific Language is used very broadly nowadays but in the case of what I’ll be talking about it’s referring to some kind of “mini-language”. It’s used to describe the construction of a specific domain object in a semi-declarative way. Examples of DSLs are Groovy builders for creating XML, HTML or UI data. The best example, in my opinion though, is the build tool Gradle itself, which also uses Groovy-based DSLs for describing software build automation . To put their purpose simply, DSLs are a way of providing an API that is cleaner, more readable and, most importantly, more structured than traditional APIs. Instead of having to call individual functions in an imperative way, DSLs use nested descriptions, which creates clean structures; we could even call it “grammar”. DSLs define possibilities of combining different constructs with each other and also make copious use of scopes, in which different functionalities can be used. As we already know, Kotlin is a statically typed language, which enables features that aren’t available in dynamically typed languages like Groovy *duck away*. Most importantly, static typing allows error detection at compile time and much better IDE support in general. As already stated in the introductory part of this post, we’ll use Java’s API for setting up SSL/TLS connections as an example here. If you’re not familiar with it, the following will provide a short introduction. We can see quite a few classes, which need to be combined in some meaningful way. 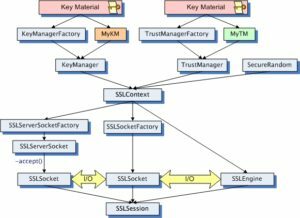 You often start at the very beginning by creating a trust store and a key store and use in combination with a random generator for setting up the SSLContext. The SSLContext is used for creating a SSLSocketFactory or SSLServerSocketFactory, which then provides the Socket instances. This sounds pretty easy but let’s observe how it looks when expressed in Java code. The abstractly described task of assembling the bits and pieces together took me little more than 100 lines of code. The following snippet shows a function that can be used to connect to a TLS server with optional mutual authentication, which is needed if both parties, client and server, need to trust each other. The classes can be found in the javax.net.ssl package. You might notice that the shown code is not a one-to-one conversion, which is because Kotlin provides a set of very useful functions in its standard library that often help with writing smarter code. This small piece of source code contains four usages of apply, a method that makes use of Function Literals with Receiver. It’s one of Kotlin’s famous scope functions, which creates a scope on an arbitrary context object, in which we access members of that context object without additional qualifiers. We’ve seen by now that Kotlin can be a lot more concise than Java but that’s yesterday’s news. In the next section, we will finally see how that code can be wrapped in a DSL, which is then being exposed as an API to the client. The first thing to think about when creating an API (and this certainly also applies to DSLs), is how we can make it easy for the client. We need to define certain configuration parameters that need to be provided by the user. In our case, this is quite simple. We need zero or one description of a keystore and a truststore respectively. Also, it’s important that accepted cipher suites and the socket connection timeouts are known. Last but not least, it’s mandatory to provide a set of protocols for our connection, which would be something like TLSv1.2 for example. For every configuration, value defaults are made available and will be used if needed. The described values can easily be wrapped into a configuration class, which we’ll call ProviderConfiguration since it will be used for configuring a TLSSocketFactoryProvider later on. We can see three nullable properties here, each of which is null by default because the clients might not want to configure everything for their connection. The relevant methods in this class are sockets(), keyManager() and trustManager(), all of which have a single parameter of a function type. The sockets() method goes even a step further by defining a function literal with receiver, which is SocketConfiguration here. This enables the client to pass in a lambda that has access to all members of SocketConfiguration as we know it from extension functions and shown with apply in earlier examples. The socket() method provides the receiver by creating a new instance and then invoking the passed function on it with apply. The resulting configured instance is then used as a value for the internal property. Both other functions are a bit easier as they define simple functions types, without a receiver, as their parameters. They simply expect a provider of an instance of Store, which then is set on the internal property. var fileType: String = "JKS"
The first one is as easy as it could get, a simple data class with, once again, nullable properties. Store is a bit unique though as it, in addition to its properties, defines three infix functions, which are acting as setters for the properties basically. We again make use of apply here because it returns its context object after invocation and is used as a tool for providing a fluent API here; the methods can be chained later on. One thing I haven’t mentioned so far is the open(name: String) function defined in ProviderConfiguration. This one is supposed to be used as a factory for instances ofStore and we are about to see this in action soon. All of this in combination creates a neat way for defining the necessary configuration data. Before we can have a look at the client side, it’s necessary to observe theTLSSocketFactoryProvider, which has to be configured with the classes I just introduced. This one isn’t hard to understand either. Most of the DSL’s content has already been shown in createSSLContext() earlier. The most important thing in this listing is the constructor. It expects a function with a ProviderConfiguration as a receiver. Internally it creates a new instance of it and calls this function in order to initialize the configuration. The configuration is used in TLSSocketFactoryProvider‘s other functions for setting up a SocketFactory as soon as one of the public methods createSocketFactory or createServerSocketFactory is being called. In order to assemble all of this DSL together, simple top-level functions were created, which represent the client’s entry point to this DSL. These two functions only delegate a function literal with ProviderConfiguration receiver to a created instance of TLSSocketFactoryProvider, which is used to create corresponding socket and server socket factories via createSocketFactory and createServerSocketFactory respectively. open("certsandstores/clientkeystore") withPass "123456" beingA "jks"
open("certsandstores/myTruststore") withPass "123456" beingA "jks"
Let’s recap: The top-level function socketFactory expects a lambda, which has access to ProviderConfiguration members since it’s the lambda’s receiver. Therefore we can call keyManager(), trustManager() and sockets() without any additional prefix here. The functions keyManager() and trustManager() take an instance of Store, which we create by calling ProviderConfiguration::open and Store‘s infix functions. The sockets() method is different as it expects a function literal with SocketConfiguration receiver, which is a data class and therefore provides access to its properties directly. I hope this is understandable. It’s absolutely inevitable to fully understand how lambdas work in Kotlin, the ones with receivers in particular. open("any") withPass "123456" beingA "jks"
open("other") withPass "123456" beingA "jks"
The code we just looked at is available on GitHub. If you have any ideas or concerns, just tell me. For those of you being experts in TLS and the JSSE lib in particular: I’m aware, that the library does not contain many cases and possibilities of JSSE yet. I hope to find people interested in this kind of library so that we can find ways to extend it accordingly. We’ve seen why DSLs can be a better way for providing APIs to a client by the example of setting up a TLS connection using the JSSE library. Kotlin is a really great language for writing such APIs because of its static typing and great features. Many other Kotlin DSL examples are available and you can find them on GitHub. As a starter, have a look at Kotlintest or kotlinx.html for instance. If you like to have a look at my examples or even want to contribute, the code is available here: SeKurity. Feel free to give any feedback, I’m always happy to help.